I am proud that Karma Loday is the CEO of Yangphel. I am proud because I know him up-close and I have spoken to some of his employees. He knows people management, which is one of the most important aspects of business management. And its good to see that such incentives been provided to its employees which would encourage the employees to work more hard and yes definitely a GNH Cos. It would be great to see that pvt firms and any other companies provide more incentives and encouragements to its workers.. This is impressive. Congratulations Yangphel. Activities such as these will only strengthen an organisation and make it more successful..
YEAH….Yangphel’s gotta lots of money…and so they are happy…THAT IS WHAT I CALL AS THE REAL GNH!!! yangphel hss been doing a great job and many congratulations . 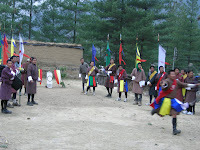 since from the existence of yeanphel archery tournament in the kingdom, many young energytic archers are becoming more enthusiastic towards it and it is indeed a good way of promoting our unique national sport. like wise i am luking forward that one day or the other, Yangphel will introduce the league system of arcehry like Barclays Premiere Leageue(BPL) so that some people can make their living by playing archery.